I say, "There are only 58 more days of school left." The student says, "Oh man, that means that I have 58 more times to get up in the morning and be somewhere all day!" I say (with enthusiasm), "And then when you are done, you get to do that for the rest of your life!" Student says, "Just kill me now." "Some people just ain't got no vocabulary." On February 27, 1974 People magazine hit the racks. So I would like to wish a Happy Birthday to all the great people born on February 27, 1974! I love Google's Stuff. Here are some things that you may not have known about previously, but I would highly recommend. Google Calendar Tons of features with this one. I have my wife's calendar shared with mine, and I get notifications via e-mail and on my phone. Google Docs and Spreadsheets Almost all of the same functionality as Word and Excel. Probably not quite as extensive, but it has almost everything that I would use, plus more. For example, you can publish your documents to the web or share them with multiple users. Gmail I don't think that I have received more than 10 spam messages in the past 2 years that I have been using Gmail. Their spam filters are amazing. Their are tons of other features that Gmail has that I haven't seen in any other e-mail before, so you should try it out if you haven't used it before. Google Talk Not as flashy as some of the other IM's out there, but I really like it, and it is getting better all of the time. Google Personalized Homepage You can put almost anything that you can imagine on the personalized homepage. Google Video Even though Google bought YouTube, I still like Google's version better. Google Notebook This is a new one, but I am getting used to it. I just installed a firefox extension that puts the notebook down at the bottom of the page. Blogger I don't care what anyone else says, I like blogger better than any of the other blog hosts out there. Google Gadgets Here are some gadgets that you can put on any web page. Google Toolbar I really love the Google tool bar. 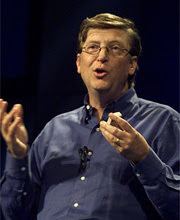 You can get it for firefox or ie. My favorite aspect is the bookmarks. It doesn't matter what computer I am at, I have the same bookmarks. Google Maps Also a favorite. When I was a truck driver, I would normally use mapquest, but I had to switch over to Google Maps because I kept entering addresses that mapquest didn't recognize, but Google would. If you really like that, you should check out Google Earth, then just for fun Google Mars and Google Moon. There is a ton of other stuff that Google does, you should check out their Google labs. I just read a post over at my good friend Rodney Olsen's blog with the title, "Why do men hate church?" After I read it, my first reaction was: hmm... I don't hate church. But I do know what he is talking about. I can remember while I was growing up, I would notice that it was the women, for the most part, that were on the spiritual track. It was the women who seemed to be reading their Bibles and having the additional prayer times and Bible/book studies. The men were there and they were diligent with their different duties. They provided for their families, they took their turn doing parking lot duty, they helped paint on the work days, they never missed a moment when the doors were open... but even as a child I noticed that it didn't go much further than that. So, when I entered adulthood and God in his great mercy reached down and jerked me out of my selfishness, I purposed in my mind that I would not be that way. More recently, when I moved to Greenville (the buckle of the Bible belt) I set up a list of things that I would look for in a church. I knew that it would be a difficult task because I saw the great list of churches in the yellow pages... there were hundreds. But one of the things that made it on my list had to do with the men in the church. I want to see men that are truly spiritual, men who are leading, men who are open and honest. (All things that I struggle with myself.) And I am so thankful that I have found a place that is like that. Just last night I went to Starbuck's with my friends Abe and Dave, from my shepherding group. We had a chance to talk together about what was going on in our lives, in our marriages, in our thoughts, etc. It was a good time, and I found myself being more honest with them than I have with any other men that I have ever known. In turn, they were very honest with me. Sometimes it seems a little odd to hear men who are spiritual talk about their struggles, but that accountability is what brings us to be more like Christ. Anyway, right in the middle of this talking, one of the guys said, "I just love going to church." But loving church isn't something that comes from exteriors. It isn't about the music or the pews or the color of the wall paper. Even though the right elements in church can make it much easier to love being there, the truth is, the right attitude flows from the heart. We love or hate church based on what was already in us to begin with. I would like to thank Abe and George for having their birthdays so close together so that I could have the day off. I have a ton to get done and really needed an extra day to get it done. Thanks guys. I am posting a video of our dog for our friend Stephanie. I know that everyone else will find this boring, but I know that she will enjoy it. To all of the rest of you, sorry about this post. I know that you don't want to see pictures or videos of our dog. Don't worry, this won't be a habit that I get myself into. On my Google personalized home page, I have NASA's image of the day. They only seem to update the image a couple of times a week, so I don't know why they call it the image of the day, but they do have some really cool pictures. My favorites are the ones that come from the Hubble space telescope and the ones that come from actual missions. I am constantly using these images as my desktop background. This most recent one I thought was awesome. 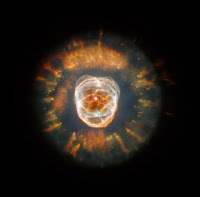 It was discovered in 1787 by an astronomer named William Herschel and was named the Eskimo Nebula because of its resemblance to an Eskimo in a parka. You can read all about it here. It is such a beautiful thing, but what gets me the most is its size. We are talking about a Solar-System sized image. I can't get my mind around it. Yet all of this Universe exists in the mind of God. He created it and He sustains it. It is like the night sky is some grand canvas that He is still working on, and it puts any paint splatter artist to shame. I just got this picture from my sister. It snowed up in Illinois and it has definitely put my snow to shame. 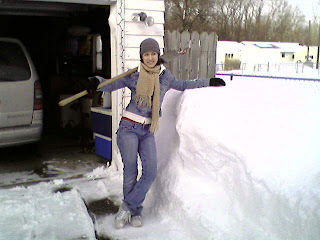 I really miss those big snows. I can only remember one really big one from when I was a kid. My dad calls it "the snow storm of '79." So it must have been big enough and significant enough to remember. I also lived up in Wisconsin on more than one occasion, and I can remember a couple of doozies when I was there. One winter I can remember that the water tower at the Northland campus froze. The entire campus was without any significant water pressure for a couple of days. A couple of smelly days. When all beside is mute. To blend their charm, and hue. The past to life again. Just found this while I was looking for the audition video. Ok, I don't really know him at all, but I feel like I do. He lives in Greenville, SC and he used to go to my church! All of my friends from church know him fairly well. He used to participate in the special music all of the time (at least that is what they tell me). My current favorite CD is Chris Tomlin's See the Morning. I just love it. The one thing that I really love about Chris Tomlin is his constant redirection to Christ. He doesn't do any singing about himself and his struggles, he just directs us to the one that it is really all about. You lift us up on wings like eagles. If you don't have this CD I would absolutely recommend it. The new blogger has labels. I can't tell you how happy I am about this. A couple of years ago I e-mailed the team at blogger and asked them if they were planning on doing something like this. I liked blogger, but the lack of categories for my blogs was frustrating. (Mostly because at the time I had delusions of grandeur for my blog, and I wanted all people to be able to go back and look at my glorious bits of wisdom in my archives.) They e-mailed back and told me that there were things in the works and they asked me to be patient. So I was. The new blogger has lots of new stuff, but the labels is the one thing that I am the most happy about. So I have undertaken the task of going back through all of my old post and adding the proper labels to each. I am not nearly halfway done yet, but I am working on it. It has been interesting going back through my old posts. It is funny some of the stupid stuff that I have put on here. Some of it I can't even figure out myself what I meant, and I am definitely not a good writer, that is for sure. In fact, lately I have been wondering why I blog at all. I think that most of the time I just want to share with somebody. I have some little thought that pops into my mind, and I think to myself, 'hmm. I ought to blog that.' I like to think that I blog to try and stretch my ability to express myself in writing, but in reality, that never comes into play when I am actually blogging. Why is it that 10 minutes in class feels so much longer that the 30 minutes of lunch that I have? Seriously, I barely have enough time to eat the crust-of-a-sandwich that I brought, check my school and my personal e-mail, and double check to make sure that I have everything else for the rest of the day, before the clock is telling me that my time is almost up. The time just flies by. But I will be in a class where the students are less than cooperative, and the last 10 minutes feels like an eternity. Ok, I promise I won't keep posting other people's stuff, but this one is really good, and I couldn't pass it up. Rule 7: Before you were born, your parents weren't as boring as they are now. They got that way from paying your bills, cleaning your clothes and listening to you talk about how cool you thought you were. 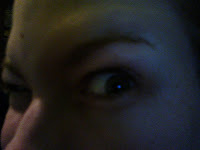 The question is, "can my sister take a normal picture of herself?" So, we didn't do much of anything today, but I think that is what snow days are for. We spent a little time in front of the fire, playing a game of Clue. Of course Charity won. She is unstoppable at Clue. The only way any one else ever wins is pure luck. I was going to try to list off a couple of other things that we did, but I have to be honest, my mind is a complete blank. I think that we cleaned up a little bit, watched some Funniest Home Videos and The Cosby Show, but other than that, we did nothing. My favorite kind of day. It is supposed to freeze tonight, and since it is raining right now, that may mean another day off tomorrow, but I'm not banking on it. I suppose that I will just have to be a teacher tomorrow. Although I don't think that we will get anything done... going to school on a Friday after a snow day, yeah right. One of the great benefits of being a teacher is the wonderful snow day. It is like an unexpected holiday! You usually start to hear about the potential the day before. There is usually a rumor going around the school, passing from student to student about some big snow storm that is going to be blowing through. Most of the time it doesn't work out, but today it did. I laid in bed this morning, watching the news, hoping to see those words come scrolling across the bottom of the screen. Now, a snow day here isn't quite the same as a snow day up north. Down here all you have to do is see a few flurries floating out of the sky and everything shuts down. And just wait and see the bread aisle at the grocery store. It is sure to be empty if there is any kind of wintery weather threat. My friends up north would laugh at the snow days down here. I have to admit that I did hear today that the snow was going to turn to ice this afternoon, and the ice storms down here are bad. Anyway, here is a little video from my phone of our front yard, so you can see our pathetic covering of snow.